Every issue one individual from our community of talented creatives and business owners share their knowledge and offer a personal guide around our market town. I am the events manager for Ludlow Food Festival and I am from Ludlow. I've lived here most of my life apart from some time away at school and University and a slightly weird couple of years in London when I didn't really know why I was there. Then I came home and that's it, I haven't left since. 2. You are heavily involved in food, tell us why? My family have always cooked and and grown food. I used to think it was so boring, they used to sit down for Sunday lunch and they would say, "Everything on our plates is from the garden apart from the meat" but now I get it. And I do it as well, my children roll their eyes but that's fine. Food has always been somewhat central in my life. My father's in the wine trade so we have always been exposed to good wine and I have always cooked. I think if you grow up in a family that cooks, you just cook, it's osmosis. You just end up pottering about in the kitchen. 2. Who are your major influencers when it comes to food? That's a good question. I would say Nigel Slater mainly, very easy, comfortable recipes that generally aren't tricky. I really like Claire Thomson (5 O'Clock Apron) who is now a friend and she's coming to the Food Festival. Really simple recipes and lots of store cupboard essentials because when you work full time and have a family, it's very hard to cook. It's prioritising it because I do love cooking. It comes naturally to me. 3. What is the link between Ludlow and food? The Food Festival started off as a small Farmer's Market just to see what would happen. Then it just grew and now it's a big, well-known event that people come to year on year and enjoy. And now I'm responsible for it. You walk around Ludlow and people are talking about food. They are smelling apricots at the market or you can go to one of the fruit and veg shops and ask them what's good and they will tell you. They won't sell you something if they don't think it's the right thing or go into a cheese shop or the butchers and ask for advice. There are people talking about food all over the place, it just comes naturally. We are also in an area of the country with amazing farmland and producers on the doorstep and that was part of the Food Festival as well – to showcase people from within this area and support them. Food is just part of the culture, it's what we do. 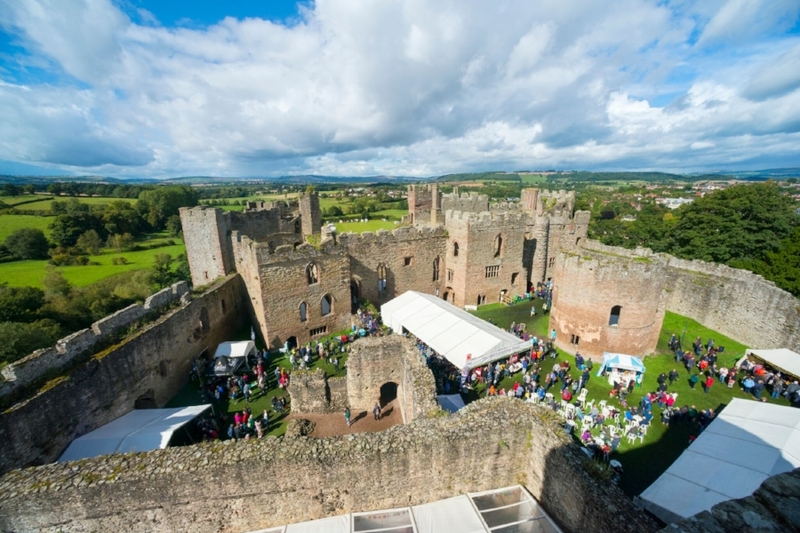 Everyone has a food festival now, it's hard to imagine a time when there wasn't one but 24 years ago there weren't any, Ludlow was the first one. 4. Tell us something about Ludlow that nobody knows. It's not a toy town, it's a proper working town with shops that people use. So you can go to the local butcher and there might be six people you know in there. The shops get used, it's not a pretend, tourist town. We rely on the tourists but it's a real market town with a market that people support. 5. How does the Food Festival involve the community in Ludlow? We involve the town as much as we can. We have trails around the town to involve the shops and independent businesses. In terms of the community, we have a lot of very helpful volunteers who give a lot of time. There are two ladies, Hilary and Janet, who come in every single week to help in the office and we have other people who come to help set up the week before and to do the break down the week after. They give a huge amount of time which is very generous because we couldn't pay all these people to do what they do. We really rely on these volunteers and they can enjoy the Festival as we give them free tickets. It is really interesting how generous and selfless people are. Some of them have done it for 24 years which is amazing. 6. How can we involve children more in cooking? Can you offer any tips? Just cook. Have them in the kitchen when you are cooking, they are nosey and want to know what you are doing. And give them a knife and let them, under supervision, chop. I run a children's cookery club at the local primary school and they all had knives, they were so excited to be actually allowed to chop stuff. It was just fruit salad, nothing very exciting but they get a lot of satisfaction out of cooking, chopping and smelling things and giving it to their parents afterwards to eat. And the shopping too, get them to choose what to eat for lunch. I guess to me it comes naturally because I have always done it but if you don't cook, it's hard to teach your children to cook so get some recipes you know well. I don't like the mess, that's quite hard, when there's flour everywhere but you have to relax about that. 7. What is the most quirky thing you do when it comes to cooking? I collect recipe books and ingredients. Having a real nose around small, independent shops like Harp Lane Deli in Ludlow, for example, where you can get lots of unique and special buys. I love travelling to Birmingham and going to Wing Yip, specialty wholesalers for Chinese foods in Birmingham. We make it special as a family and go to the restaurant for fantastic dumplings. 7. What would you do with a guest coming to stay in Ludlow for the weekend? Walking and eating! I would definitely take them on a walk around the market and grab some nice things for lunch from the market and show off all the nice independent shops that we have. We can walk by the river and have a coffee at CSONS. I would probably also head to either Mortimer's Forest or Carding Mill Valley in Church Stretton. A nice walk up in the hills there, building little dams with the children in bubbling brooks. Have a picnic with sheep trying to steal your sandwiches, it's all pretty low key. Another thing, I would go anywhere with a good view of the Shropshire Hills. I would take my guests to the top of a hill, generally, that's what we do and then a nice supper with things we have bought from the butchers. I love all the weird satellites on Clee Hill and it's good for bike riding with children. Or even a walk up to Flounder's Folly. A low key weekend: food and a nice walk to walk off the food! 8. And finally, what is the appeal of coming back to Ludlow with children? It's the community spirit. My growing up here. It's a bit like settling into my skin and it's comfortable. It's a mutual passion for Ludlow amongst the people who come here and those from here. There's also another side to food in Ludlow working with great groups like Hands Together and the Ludlow Food Bank to support people in need. Also key is that my parents and mother-in-law live here so I have babysitting which is very helpful! My kids go to the local primary school and we can walk to school every day and they know everyone, they pass people in the street and say hello and they love it there. Hannah Mackley, events manager at Ludlow Food Festival grew up in Ludlow in a home that her family has been in for generations and with parents involved in food industry. She always had a passion for food and loves Ludlow’s community vibe. Viv Parry is a long-time resident and a force of nature, which is helpful, since she drives not only Ludlow in Bloom adorning our streets with towering, magical displays of flowers; but is also a long-term local town councillor who dearly loves spending time helping local folk. This is week, we talk to Adam Tutt, owner of Blue Boar pub and Chang Thai restaurant. Mari Kure, owner of Ludlow’s only Japanese restaurant, the deliciously distinctive ‘Koo’ takes a stab at our insider's questionnaire.